Every trip has its backstory. They just don’t usually feel as earth-turning as this one. Normally it’s where to go; who can come; whether we’re fit enough; and who’s providing transport. This summer all that was deeply overshadowed, quite literally, by bushfires. They began in late December 2018, when dry lightning strikes ignited several fires in the Tasmanian highlands. In what is starting to look like the new normal, thousands more lightning strikes occurred on January 16 and 29. I watched a simulation of the lightning storms as they crossed from north-west to south-east. It was as though a vast and merciless dragon was swooping and swerving across our island, breathing deadly fire, now to the left, now to the right. The fires started by the dry storms continued burning for weeks, along a vast front. 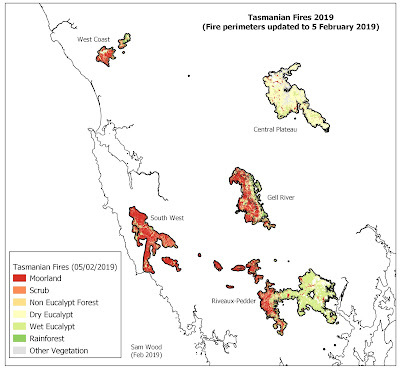 By early February 2019, over 40 fires had burnt around 200,000 ha, almost 3% of Tasmania. There’s a more personal slant to the story. By January 4 the Gell River fire in the central south-west had grown into a monster. 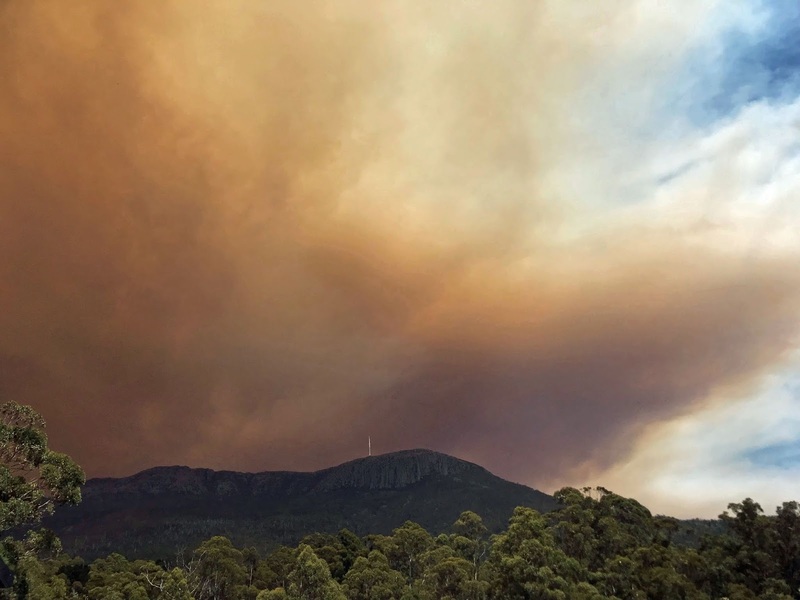 As it roared down the Vale of Rasselas, a vast smoke plume spread westward, piling high into the sky behind kunanyi/Mt Wellington. An eerily murky pall settled over the city of Hobart for days. Nobody could breathe easy in any sense. All day long we had the radio on, listening for updates, wondering if the fires would reach Hobart. We hastily worked out our fire plan, with southern Tasmania’s disastrous 1967 fires firmly in mind. That calamity claimed 64 lives, injured around a thousand, and razed 1300 buildings. If fire struck here again our plan was simple: get out early. Twice we packed overnight bags and precious items. 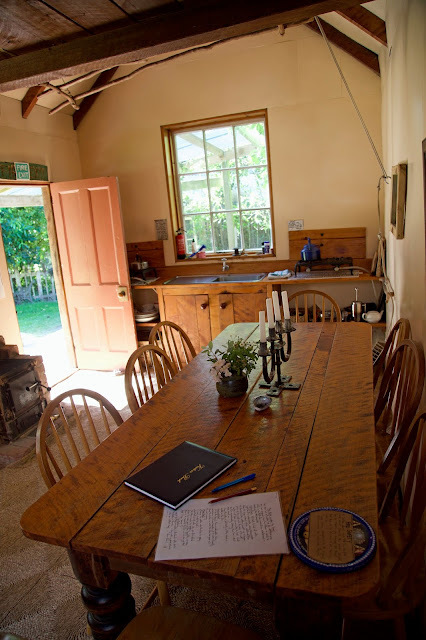 We photographed parts of the house interior, in case we’d need to remember what was replaceable. The irreplaceable would be just that. 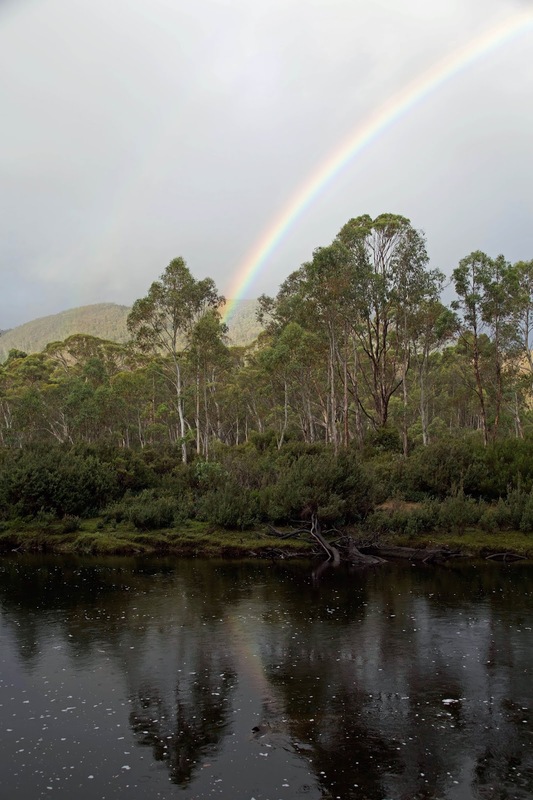 If that wasn’t unsettling enough, we were deeply troubled that the fires were burning through the heart of Tasmania’s Wilderness World Heritage Area. 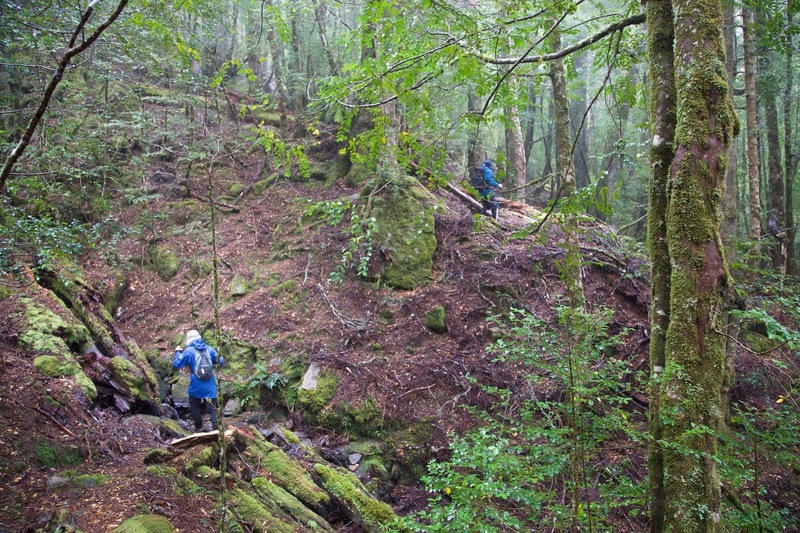 They tore through wet highland forest and lapped up to the achingly beautiful Lake Rhona. All the while the weather stayed relentlessly hot and dry, the usually wet westerlies tight-buttoned and sober. Fire sped east and south, igniting the ridges leading towards Mt Anne and its irreplaceable King Billy pine forests. 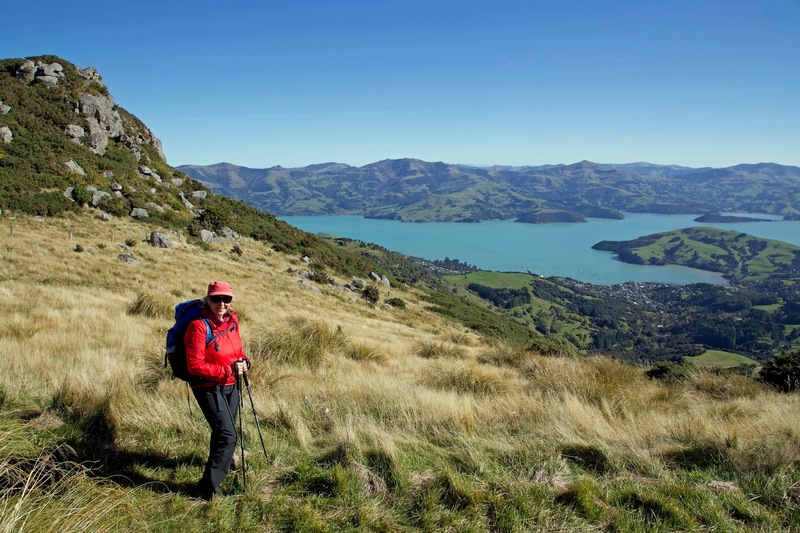 They raged across buttongrass plains and up the slopes of the iconic Western Arthur Range. They menaced the majestic Gondwanan forest on the flanks of Mt Bobs, with half an eye on Federation Peak itself. They crawled across the Central Plateau near Great Lake, taking out some pencil pines, cushion plants and cider gums. These are just some of the places I know personally. Hundreds of other precious wild places were burning at the same time, not to mention the forest and scrub fires that were threatening – and already destroying – homes and properties in the Huon Valley to the south-east. Up to 700 firefighting staff and hundreds more volunteers employed firebombers; helicopters; temporary irrigation systems; chemical fire retardants and just plain elbow grease to try and limit the damage. Gallows humour aside, I was deeply despondent, but also angry. 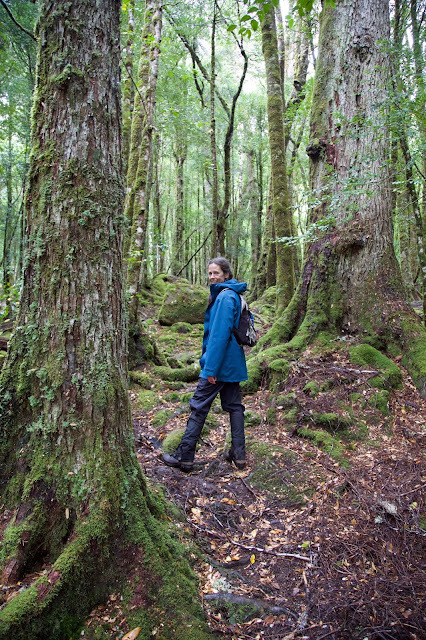 It felt as though my heart country, those wild and wet places that are refuge for the wonderfully strange vegetation of old Gondwana, was under brutal assault. At the same time it seemed our political leaders were actively refusing to acknowledge that this – and the mass fish kill in the Murray-Darling; and the unprecedented bleaching of coral in the Barrier Reef; and the newly minted record hot/dry January all over Australia – resulted from climate change. And not the slow and incremental change we might have expected, but sharp and damaging change. I did pray for rain, and I also planned to get out there – somewhere, anywhere – to feel the wilderness beneath my feet; the clear air in my lungs; and just perhaps to hear the whisper of Gondwana again. With many of the usual tracks closed because of fire risk, we ummed and arred in the lead up days to our walk, trying to settle on somewhere we could still go. And then, of course, it began raining: beautiful, long, soaking wet rain. Where we live we had around 40mm overnight, with the promise of more to come. We could hardly complain, but the wet forecast further restricted our options. Be careful what you pray for! So, on a wet and windy Saturday, five of us finally found ourselves on the ferry trip up leeawuleena/Lake St Clair. Our far-from-adventurous destination was Narcissus Hut, just a few hundred metres from the ferry jetty. It’s not exactly the heart of the wilderness, but as we lugged our packs from the jetty to the hut, it felt good to hear the currawongs call, and the dollops of rain on the roof, and the whoosh and scratch of wind in the trees. 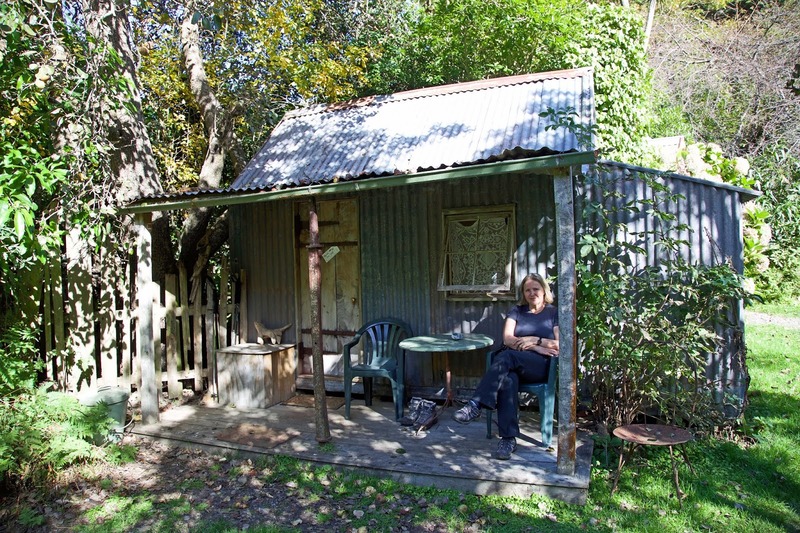 Narcissus Hut is the poor relation of Overland Track Huts. Most who reach it are intent on going somewhere else: either home via the Lakeside Track or ferry, or up to Pine Valley Hut for more exploration of the national park. We – and plenty of freshly arriving Overland Track walkers – soon learned that the route to Pine Valley was shut. So quite a few walkers hastily re-arranged their plans; tried to change their ferry booking; or simply decided to stay a night or two at Narcissus Hut with us. With the exception of Jim, who loves a hut, we’d set up tents on the nearby platforms. Still, it rained a lot, and Narcissus is a small hut. So with everyone cooking inside, we cooked and ate in shifts. 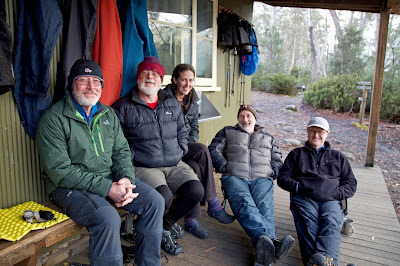 It’s always interesting to hear what walkers have thought of their Overland Track trip, and we had a fine social time conversing with walkers from places as far away as Macau, Venezuela, Alaska, Taiwan, Canada and France. But it wasn’t quite the wilderness time we were hoping for. So on Day 2, regardless of the wet forecast, we filled our day packs with all the necessary gear, donned our waterproofs, and headed off towards Byron Gap. Less than 10 minutes into the walk I could already feel the wildness doing me good. After 20 minutes on flat boarded track, we reached a track junction in wet forest, and turned towards the Gap. Starting from an altitude of around 700m, we knew we had a nearly 300m climb to reach there. But the narrow, winding track through tall forest beckoned. I won’t say it was easy: it took over 2 hours to get to Byron Gap. But I must say it was sublime. No one in the group had been on the walk, and I’d talked it up with phrases like “brilliant rainforest” and “superbly uber-green, mossy and beautiful.” My apprehension at having over-sold the area quickly dissolved, and the sighs and soft words of appreciation told me it was working on the others too. Never mind that it was raining, it was a rainforest!! Better still it was a glad, green and growing one. And for now at least, it was safe from the fires that we prayed were being taught wet lessons from this stern and insistent rain. 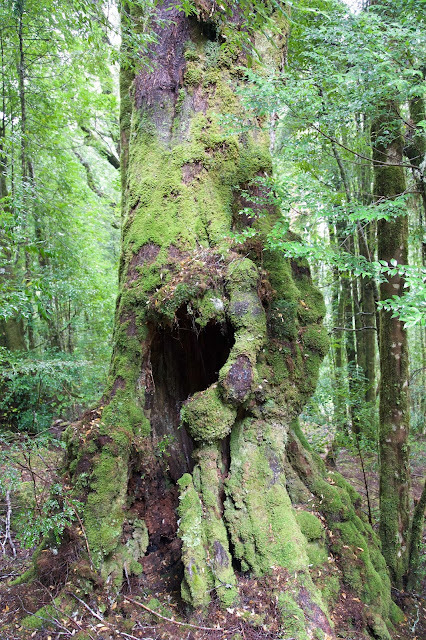 I wonder sometimes whether my love for these Gondwanan forests verges on the mystical. 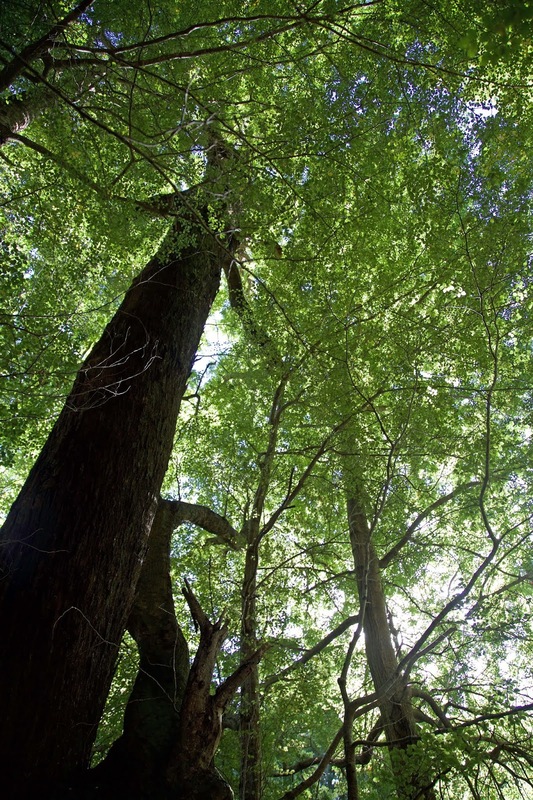 The sassafras, myrtle beech, King Billy pine, celery-top pine, fern and leatherwood of these forests are plants with links back to the supercontinent of Gondwana. They’re kin to plants found in other former Gondwanan places like New Zealand’s South Island and Patagonia. They are also completely unlike anything I grew up with. Yet before I’d met them I used to draw forests just like these: with green mossy tree trunks, bright glossy leaves, ferns and a carpet of fallen leaves everywhere. And always there were waterfalls … and probably fairies too. This childhood dream was dampened by sweat, rain and some blood-sucking reality by the time we stopped at the un-forested top of the Gap. After more than a month of heat, drought, and a lack of victims, a legion leeches warmly welcomed us to their world. 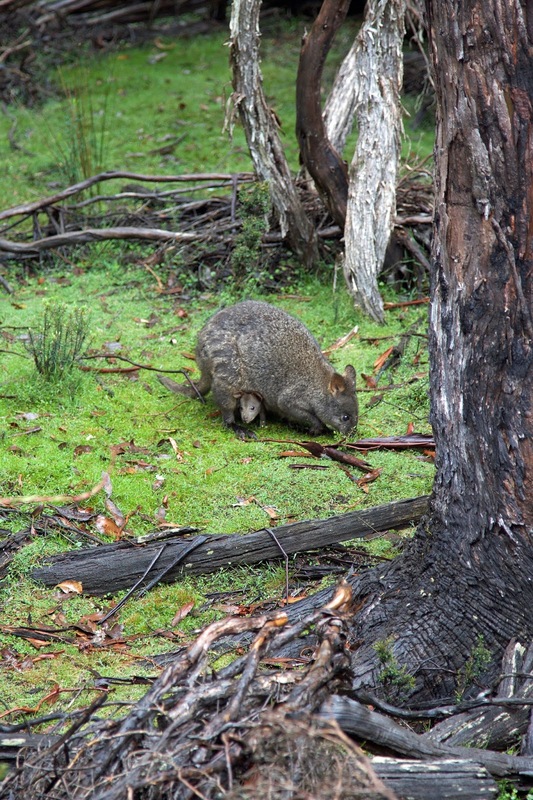 Between showers and glimpses of nearby Mt Byron, we had a restless and rapid lunch. After plucking off as many leeches as we could find, we turned around and descended back to where we’d come from. If tiredness and a slight itchy paranoia took some of the gloss from the wonders, it was still as marvellous descending through the forest as it had been going up. That green glow stayed with us back at the hut, and well beyond. Narcissus and reflections: I suppose they go together. After a month under the dire spell of a this 2019 fire dragon, my mind wandered into the territory of myth. Perhaps I was hoping for a brave St George to slay this dragon. Instead, among our political leaders at least, I could find only a weak and witless Narcissus. 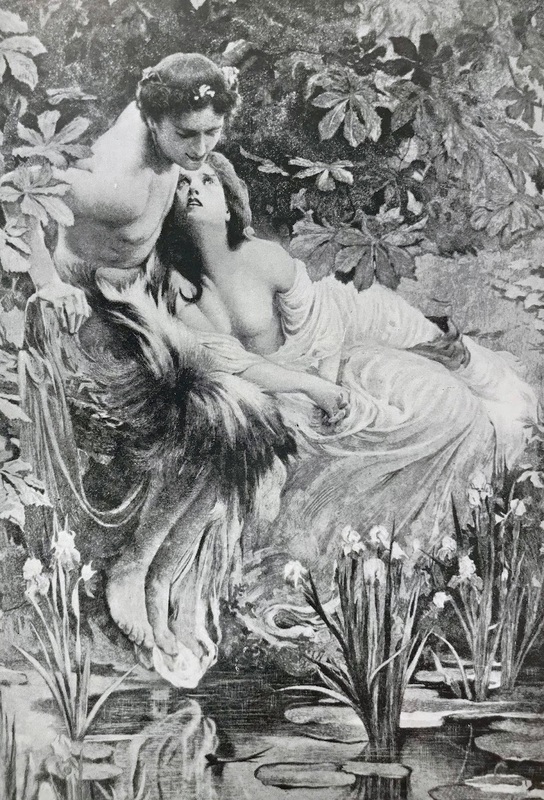 In the original myth a beautiful nymph named Echo fell in love with Narcissus. But he did not return her love. Instead he became so enamoured of his own reflection in a pool of water that he gazed at it day and night, eventually dying for lack of food and sleep. And Echo, broken-hearted, wandered into the mountains, where she pined away until only her melodious voice remained. I know it’s not just our leaders who are focussed on themselves. So many of us are enchanted by how fine we look reflected in the glow of the things we’ve created. But it's not just about us. While we're busy admiring ourselves, and pretending we are masters of all, the world of nature, like Echo – and perhaps also Gondwana – retreats into the mountains and begins to fade away. Overnight the wind strengthens. Even here, in Stony Bay Farm’s protected woodland, cradled deeply beneath encircling hills, the wind and rain crash around us. Autumn has suddenly arrived. That’s reinforced when the walnut tree that hangs over our little cottage drops bits of its clunking cargo onto our tin roof half the night. But we’re so warm and cosy, and so used to possum noises at home, that we hardly notice. Just fleetingly we chat about the issue of walking out in the wet, steeply up, then steeply back down, particularly given Lynne’s sore knee. 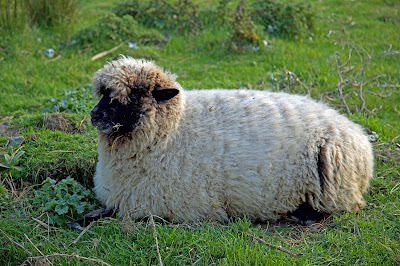 But before we come to any conclusion, our tired, well-fed bodies succumb to sleep. And in the morning, while the wind’s still fresh, the sun is shining. After breakfast we learn that two of the other walkers have arranged to be “jockeyed” out with the supply van. One of them is unwell with a virus, and the prospect of the nearly 700m climb to the rim of the old volcano has proved too much. Lynne has considered the same option, but is determined to complete the circuit. We wish the others well, hoist our packs, and start to walk out the only way we know how: one step at a time. The initial climb is gradual, and through lush planted garden, but soon we’re climbing more steadily through rough, regenerating bush. 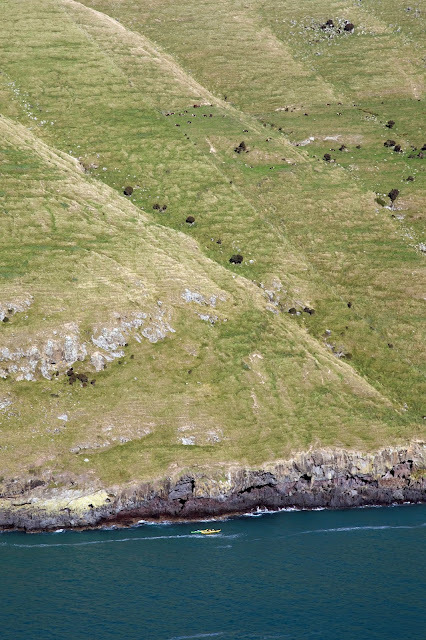 This is part of the Hinewai Reserve, 1250 hectares of Protected Private Land. Amid weedy species such as gorse and broom, native ferns, shrubs and trees are slowly returning. The theory is that, if fire and grazing animals can be excluded, the native plants, sheltered by the weeds, will soon become dominant. I confess I find this ugly to walk through, and it seems a second-best way to achieve such a result (the best being to leave it intact in the first place). But hindsight is a marvellous thing, and by the time we reach some of the remaining intact forest, I warmly applaud this effort to make good what was once here. 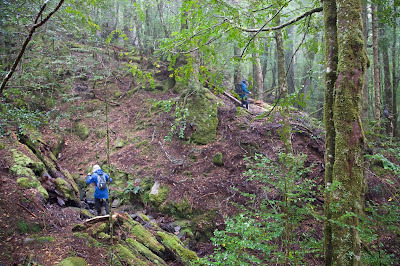 The best of the remnant beech forest is on the steepest slopes, surely because they were the most difficult for 19th century tree-clearing techniques to reach. 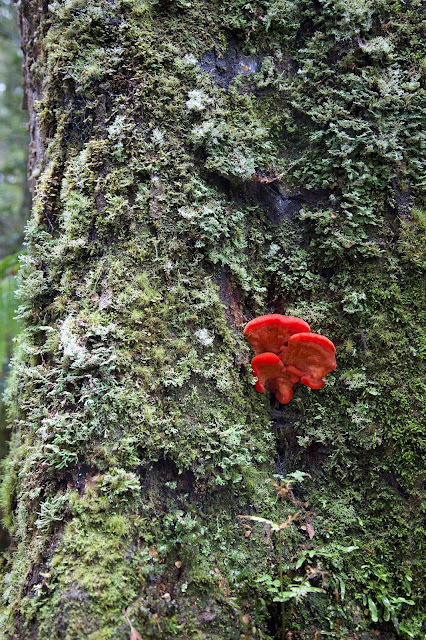 As we sweat our way up through the forest, our warm applause soon become stunned awe. The dominant red beech/Tawhai raunui (Nothofagus fusca), some of which are probably several hundred years old, are a wonder to behold. 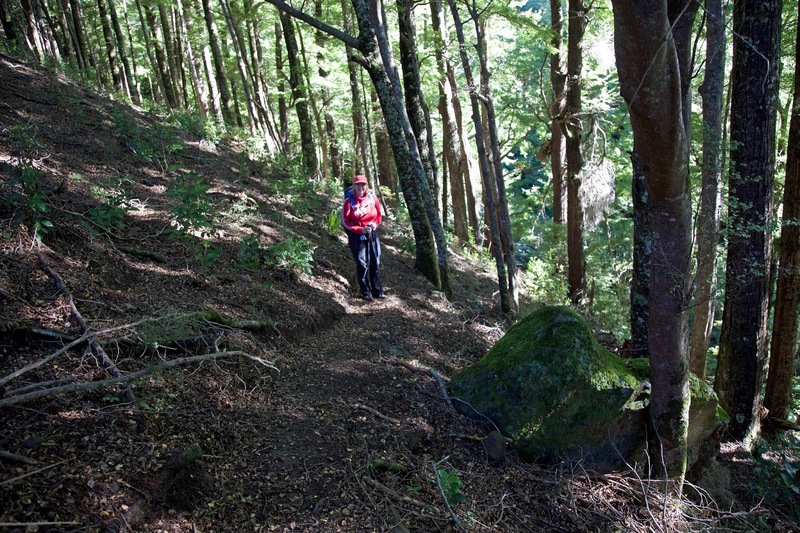 Their dappled, deep green shade gives both excuse to pause, and inoculation against some of the pain of the climb. As we ascend further, the trees diminish in size and vary in species. Is it just me, or does everyone on a climb like this think “and just around this corner we’ll break out into the open tops”? The short answer is always “No!”. But thankfully the long answer is eventually a relieved “Yes! 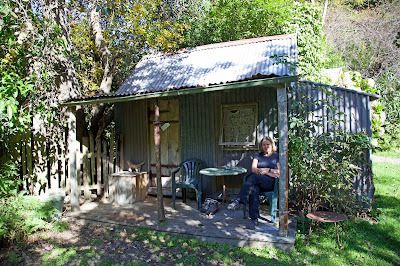 !” On this occasion, the walking track breaks out onto a 4WD track, and before too long we’re at the Tara Track shelter. We’ve reached an altitude of 690m, and it’s taken us less than 3 hours. 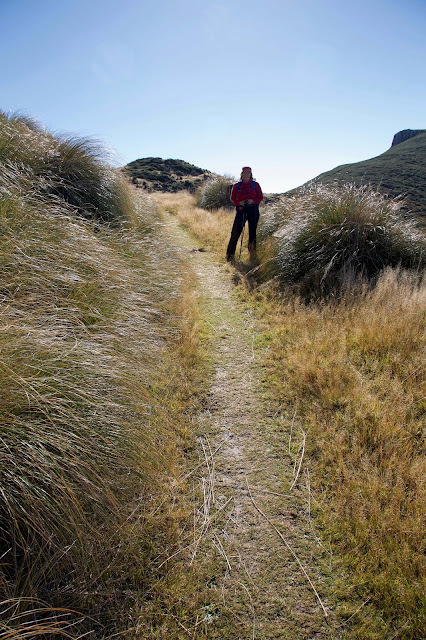 We celebrate with our remaining cheese and bikkies, then wander along the now easy grade track, through open tussock, to our descent point. The rain has not only held off, the skies have completely cleared. As we stand near the viewpoint above Akaroa, the sky and the harbour seem to vie for the title of best blue. But not all is straightforward. While descending is usually easier than ascending, Lynne’s sore knee has found the opposite on the previous two days. We talk about taking it slowly; stopping frequently; resting the knee as much as possible. But it’s still with some apprehension that we start the long descent. All of that makes it all the more pleasing that we get to the bottom in little more than an hour, and with virtually no knee issue. That’s not to say we’re not exhausted, and that we’re not mightily pleased to see our car at Mt Vernon Lodge. 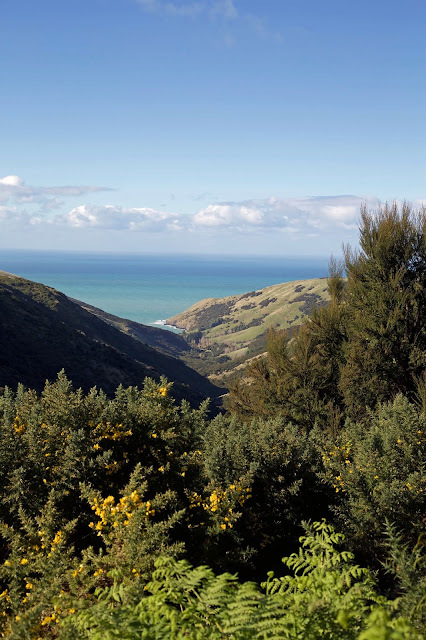 But more than anything we’re proud of completing our circuit of the headlands, cliffs, forests and farms that make up the beautiful Banks Track. 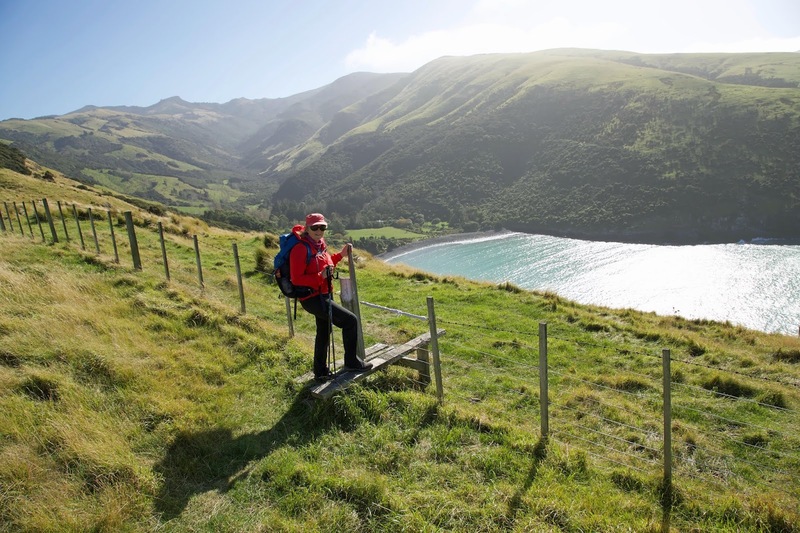 All that remains is to find a little French café in Akaroa for a celebratory drink. And perhaps a pain au chocolat or two. It may be a luxury to finish a day’s walking at lunchtime, but it’s not an unwelcome one. It gives us a chance to rest, to check out our little cabin, and to socialise over lunch. The Flea Bay farmstead is supplied with a basket of freshly-laid eggs and a few other supplies alongside an honesty box. Lunch is quite an eggy affair for most of us. 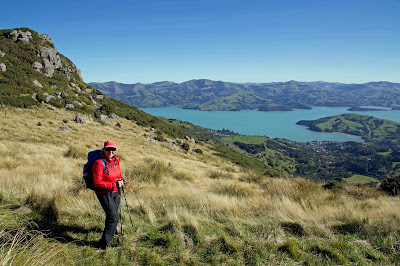 After lunch we farewell Joh and Mark, whose 2 day walk requires them to walk on to the next hut at Stony Bay. We feel for them having another 2-4 hours more walking ahead of them. Lynne and I are very glad we don’t have to do the same. Instead we wander 100m or so over to Flea Bay itself. It has a cobble beach, and with the wind blowing hard, there are waves biting into the steep shore. We’re surprised to see a group of kids out swimming with a huge inflatable inner tube. The tube, possibly from a tractor tyre, is anchored by some adults via a stout rope. Every now and then there are squeals of laughter as a wave knocks the kids off the tube. We chat with the adults, who are spending a weekend on a nearby farm owned by family. They’ve been coming to the bay for years, and love that the third or fourth generation of family members is getting acquainted with this remote and beautiful place. 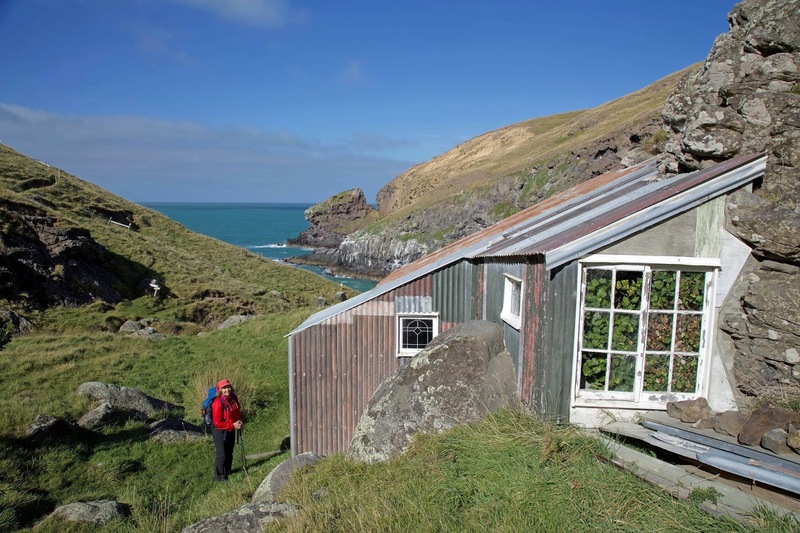 Later the owners of the Flea Bay farm come to offer walkers the chance for a guided sea kayak trip tomorrow morning. Seals and dolphins are regulars in the bay, and its spectacularly steep surroundings make the kayaking idea very tempting. But in the morning the wind is still very strong, and large swells are breaking in the bay, so we decide to walk on. Of course those same steep surroundings make for a steep ascent, firstly towards the head of the bay, and then up and over the hills and cliffs that will eventually lead to Stony Bay. Near the seaward end of the bay we look down and see a pair of kayaks. They’re hugging the less windy western side of the bay, but I still count them brave being out in these conditions. Whether you’re on the water or up here in the hills, there’s no doubting the incredible spectacle all around you. 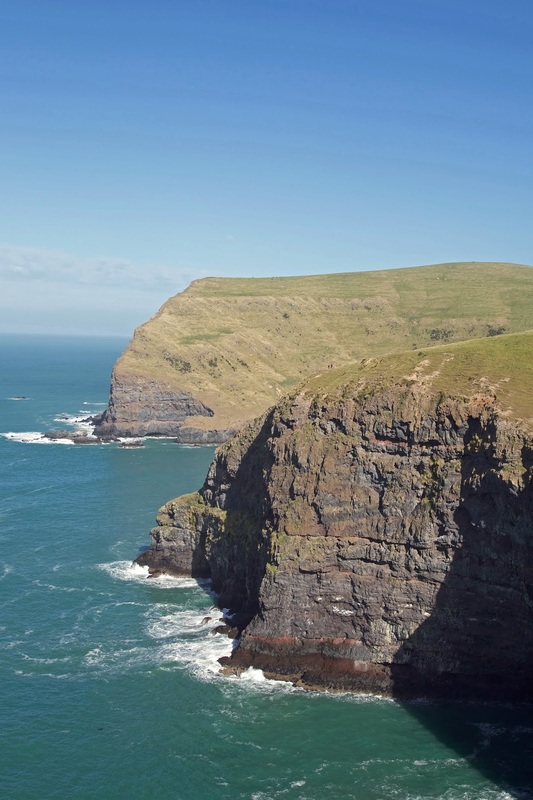 If the bay is steep-sided, the hills further east simply tip into the sea over vast, dark cliffs. Offshore rocks and inaccessible islands make home for thousands of sea birds, and further off the coast we watch a stout fishing trawler rocking and rolling its way towards the port of Lyttleton. 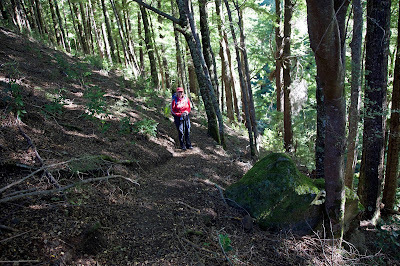 The track meanders up and down, often close to the edge, but sometimes darting diagonally inland to avoid steep gulches. The inner edge of one of these gulches has an eccentric shelter hut tucked in against large boulders. Presumably it was once used by farm workers, or possibly fishermen. It features a couple of leadlight windows and an outside long-drop toilet. We go in for a look, and are surprised to see some plants growing against a window in one corner. We’re less surprised by its rough and rustic state. Just beyond the hut our path passes a rocky shore which features a sea-cut cave. Mixed in with the swash of the waves, we hear some plaintive barking noises. Our suspicions are confirmed by a roughly-made sign: seals live in the cave. 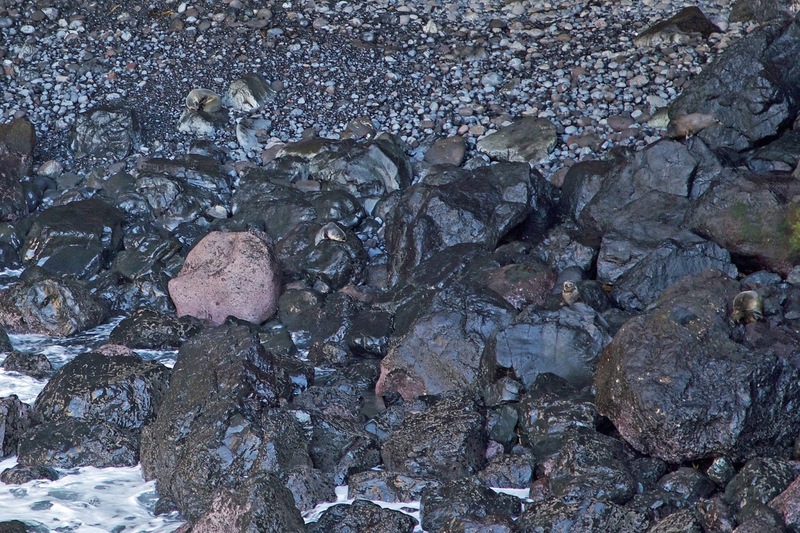 We cautiously peek over a rocky edge, but given how well they blend with the rocks, it takes a few moments before we see perhaps a dozen seals dozing in the shade. New Zealand fur seals (Arctocephalus forsteri) were once hunted so “successfully” – both here and in Australian waters – that they were close to extinction by the end of the 19th century. Their Maori name, kekeno, translates “look-arounds”. It’s a behaviour that may have helped them survive: that and the (now welcome) collapse of the whaling and sealing trade. We leave the seals to their wary slumber and climb back up to high cliff level. 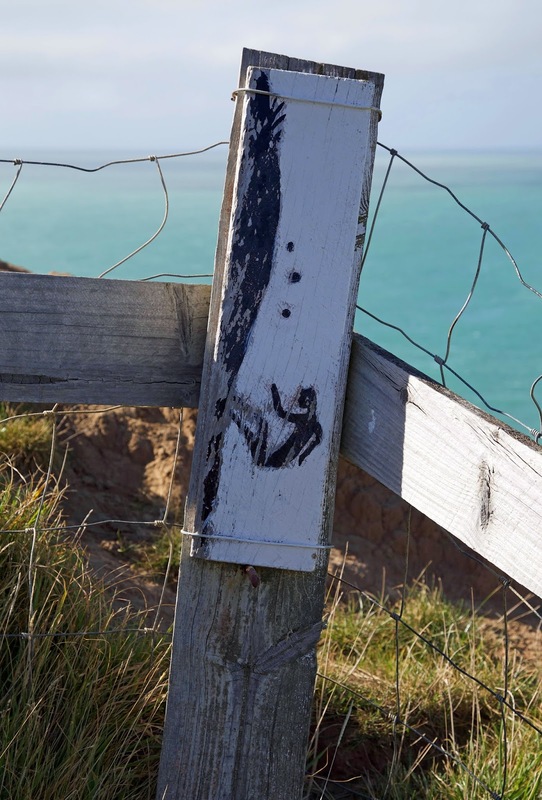 Part of the cliff-line is fenced off, not so much for our safety as for the protection of sea bird colonies, especially the sooty shearwater/titi (Ardenna grisea). This is yet another species that was hunted close to extinction, and is still rare. Near another highpoint we climb a stile and our destination, the aptly named Stony Bay, is in sight. After yesterday’s downhill difficulties, we’re a little anxious about how the descent into the bay will affect Lynne’s knees. Although it’s long and reasonably steep, we take our time, stopping to admire the scenery, and to marvel at the exotic plantings put in by the Amstrong family. 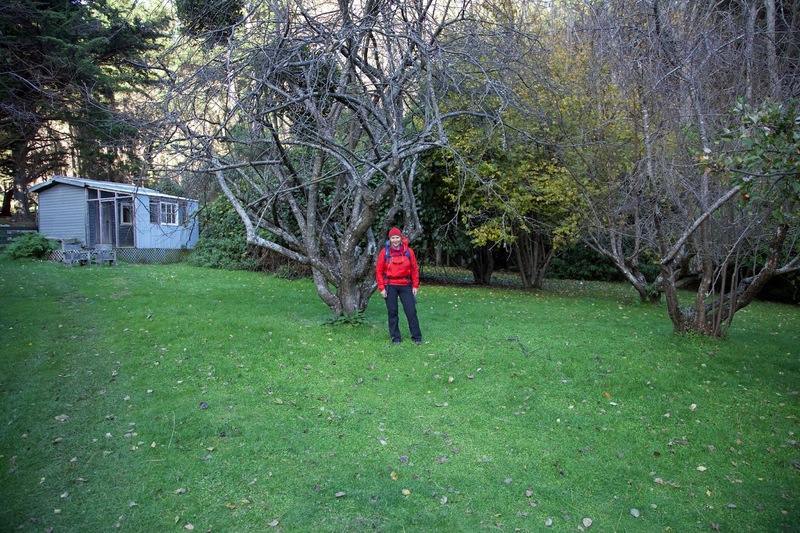 In their informal arboretum we even recognise a few home plant species, including some honeysuckle banksia (Banksia marginata), which are Tasmanian endemics. Lynne is hobbling and in pain by the time we traipse around the shoreline and find the complex of buildings near the Armstrong family's homestead. But there’s comfort to be had here for sure, including a delightful tiny cabin for the two of us, hot showers, an outdoor wood-heated bath, and a communal hut with a fireplace and a fine old dining table. The quaint buildings are all set higgledy piggledy within delightfully shady grounds, all overtopped by a mix of exotic and native trees. Best of all there’s a tiny little “shop”, with fresh and tinned produce, a selection of meats, and a surprisingly good assortment of New Zealand and Australian wine. My inner Aussie-male comes to the fore that night. Armed with tongs and a fork, I offer to cook for everyone on the little barbecue that's housed in one of the out-buildings. Of course as soon as I get cooking, a cold rain starts. And then the wind gets up as well, making me feel right at home! It’s a delightful evening. Each of us feels proud that we've made it this far, and that - thanks to the little shop - we can enjoy together what now feel like exotic luxuries. We top it all off with a final dram in front of the little fire. The wind and rain continue to do their worst: but somehow, for now at least, all manner of things are well.